Canon revealed 3 new camcorders, including the XF405, XF400 and VIXIA HF GX10, all with 4K/60p video recording, as well as the Canon DP-V2411 studio monitor. The DP-V2411 is set for an early December 2017 release with a tentative $20000.00 price . For more information please visit, USA.Canon.com. MELVILLE, N.Y., Sept. 12, 2017 – Canon U.S.A. Inc., a leader in digital imaging solutions, today announced three new additions to the company’s video camcorder lineup: the XF405 4K UHD Video Camcorder, the XF400 4K UHD Video Camcorder and the VIXIA HF GX10 4K UHD Video Camcorder, three lightweight and compact video camcorders that feature 4K/60p video recording. The Canon XF405 and XF400 4K UHD Video Camcorders are both ideal for applications like broadcast interviews, documentaries and weddings. Designed with advanced amateurs and hobbyists in mind, the VIXIA HF GX10 4K UHD Video Camcorder provides the same high- image quality as the Canon XF405 and XF400. All three models feature a newly developed 15x optical zoom lens (35 mm film equivalent: 25.5mm–382.5mm), to support 4K recording, alongside a 1.0-inch CMOS sensor and Dual DIGIC DV 6 image-processing platform, to produce stunning 4K/60p recording across the entire zoom range. In addition, the compact and lightweight body designs measure approximately 5.3in (l) x 3.8in(h) x 8.4in(d) and weigh approximately 40.5oz, 40.3oz and 40.2oz for the XF405, XF400 and VIXIA HF GX10, respectively. The compact and lightweight nature of all three 4K UHD models provide great mobility when shooting such scenes as news reports and events. All three camcorders provide users with fast, highly accurate focusing through intuitive touch-panel operations and feature Dual Pixel CMOS AF—a technology that offers smooth Auto Focus(AF) operation with high-tracking capabilities, making it ideal for shooting video. MELVILLE, N.Y., Sept. 12, 2017 – Canon U.S.A. Inc., a leader in digital imaging solutions, today announced the Canon DP-V2411 4K HDR1 Reference Display, a 24-inch display that features stable high luminance and 12G-SDI terminals, ideal for use on-set in broadcasting vans, and in-studio needs. Highlighting Canon’s proprietary display image processor, LED direct backlight system design and an In-Plane Switching (IPS) LCD screen, the DP-V2411 display provides users with detailed and precise color reproduction as well as high resolution, high contrast and high luminance, allowing for accurate review and confirmation of 4K and HDR video content. The DP-V2411 Display reaches peak luminance and full-screen white luminance of 600 cd/m, helping to prevent changes in luminance that can occur depending on the video images being viewed. These video images feature stable high-luminance performance for even more precise luminance and color review confirmation of 4K HDR video when shooting on location or in a studio. 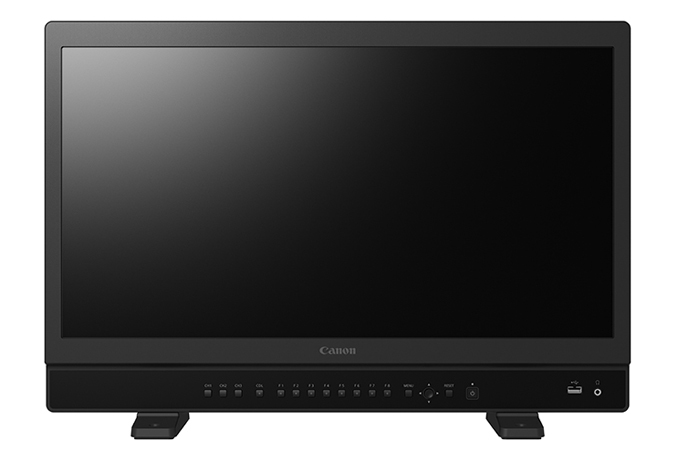 Compared to a 4K reference display equipped with 3G-SDI that would require four cables to transmit 4K 60p footage, the Canon DP-V2411 Display features 12G-SDI terminals requiring a user to only use a single cable. By reducing the number of necessary cables, the display supports more cost-efficient, less time-consuming installation, while reducing weight and saving space. Alongside the current lineup of Canon 4K HDR reference display, the Canon DP-V2411 supports Electro-Optical Transfer Functions (EOTF) such as Hybrid Log-Gamma, a broadcasting HDR standard; Perceptual Quantizer (PQ), a HDR standard for film production and transfer; and Canon’s proprietary log gammas—Canon Log, Canon Log 2 and Canon Log 3. In addition, the new display features convenient shooting assist functions for all HDR standards as a waveform monitor. This displays the luminance level of input signals and a false color function, which overlays different areas of input images with colors depending on their luminance allowing for convenient review and confirmation of HDR images. The DP-V2411 is scheduled to be available in early December 2017 for an estimated retail price of $20000.002 . For more information please visit, usa.canon.com.